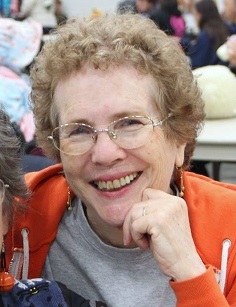 Linda Miller is a dear friend, ministry supporter, lover of God and a wordsmith extraordinaire. Her poems, reflections and verses have blessed me many times over. I invited her to my blog today and pray you will be blessed by her heart as much as she touches me. As life takes its toll on each of us, we can see the evidence on our bodies and in our spirit. Life may not be what we expect, but God is never surprised. This was inspired by a favorite old aluminum measuring cup…with dents on the bottom and cracks on edges. To most people it would be something to throw away, but I still use it for rice and beans. I cannot buy another one; they are no longer made. You are also one of a kind. God still has a purpose for you, no matter the age or scars. A vessel to be used. Creases from time and wear. But it still has love to share. With a measure of Your Grace. Until with You I take my place. Linda’s beautiful verse reminds me of an old Indian fable I loved so much, I included it in my book Hollow Victory. A water bearer in India had two large pots, one hung on each end of a pole which he carried across his neck. One of the pots had a crack in it, while the other pot was perfect and always delivered a full potion of water at the end of the long walk from the stream to the master’s house. The cracked pot arrived only half full. For a full two years this went on daily, with the bearer delivering only one and half pots full of water in his master’s house. Of course, the perfect pot was proud of its accomplishments, perfect to the end for which it was made. But the poor cracked pot was ashamed of its own imperfection, and miserable that it was able to accomplish only half of what it had been made to do. 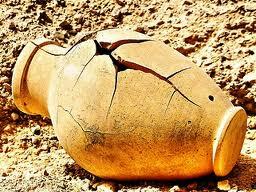 We are all cracked pots, but praise God, He still uses us for His honor, glory and plans. Linda’s reference to a broken vessel sounds so much more romantic than being called a ‘cracked pot’ but you get the idea. You are valuable. You are treasured. Your purpose is far greater than anything you can imagine.